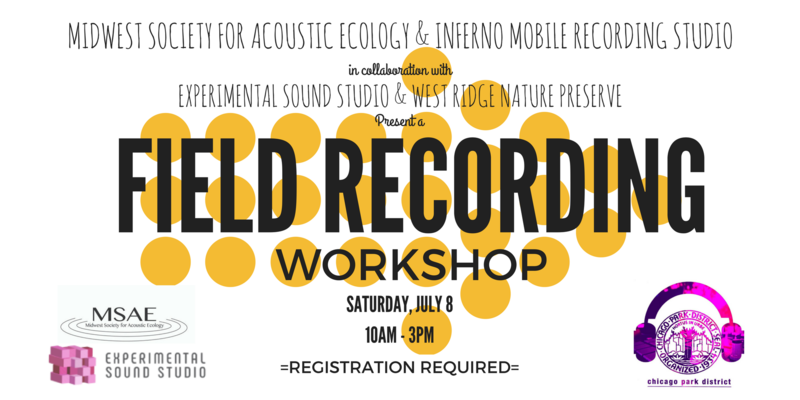 We are thrilled to announce a very special opportunity for a field recording workshop in collaboration with Inferno Mobile Recording Studio, Experimental Sound Studio and West Ridge Nature Preserve. This is a one day workshop that will take you outside to record the soundscapes at West Ridge Nature Preserve and learn studio processing techniques at Experimental Sound Studio. Space is limited to ensure everyone has equipment. If you are interested do not delay on registration, we will only be able to take six people! Registration opens Friday, 6/30 at 11am and closes Friday, 7/7 at 6pm.